I’m so excited to be a part of the Truthwitch Street Team (go Air Witches!). 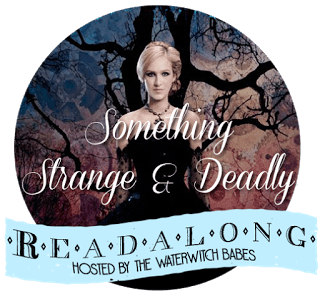 To help celebrate Susan Dennard and the upcoming release of Truthwitch, Stephanie Kaye from Steph In Wonderland is currently holding a (re)read-a-along of the Something Strange & Deadly trilogy! If you haven’t read this trilogy yet, now’s the time! Below, you’ll find my answers to a few of the questions for the second and last discussion. 3. What do you think about Daniel’s answer to Eleanor’s question? Do you think he was being honest? Daniel was not being honest with Eleanor. He’s totally in love with her. 4. What was your first impression of Jie? I definitely thought Jie was a guy at first. 7. Who is your favorite character in the first book and why? I really love Daniel and Jie, but I have to go with Eleanor! I love her sass and fearlessness. 8. How would you convince your friends to read this book? I just sort of begged my best friend to read this trilogy and brought her the books to school one day last year! She loved them but still holds the third book’s ending against me. Oops!